Dan Richard, left, and Jon Garber are shown prior to the area planning commission meeting. 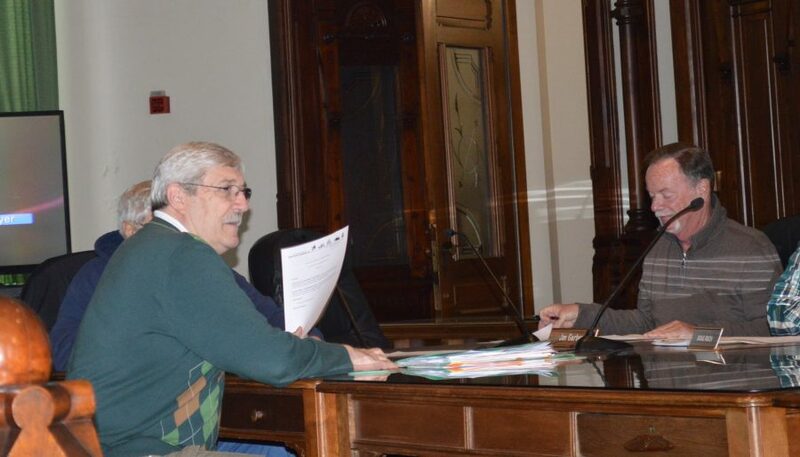 WARSAW — David Davidsen’s petition to rezone land from residential to commercial in a residential subdivision was not looked upon favorably by the Kosciusko County Area Planning Commission. During its regular monthly meeting Wednesday afternoon, April 4, in Warsaw the APC by a 5-1 vote recommended denial of the petition. Davidsen wants to expand his pier service business located just south of North Webster near the intersection of SR 13 and CR 500N. He purchased residential lots in a nearby subdivision, Oakland Hills, with the intent on expanding his business. His petition was originally on the agenda of the March APC meeting but was tabled for a month to allow a meeting with the subdivision property owners to see if an agreement could be reached. Steve Snyder, an attorney representing Davidsen, said a meeting was held March 20 and was well attended, but no conclusions were drawn. It was noted by Worth Packer, who owns several lots in the subdivision, another meeting was held Sunday evening, April 1, in the home of one of the homeowners. He said opposition to the petition grew stronger after that meeting, primarily because the property owners in the subdivision wondered if Davidsen had in mind a second rezoning later and they also feel his business has not been in compliance with the county ordinance. A few remonstrators spoke at the APC meeting and noted the traffic is “horrendous” on Baldwin Road, a road coming off 500 North, and sometimes semi trucks are parked along the road blocking cars from entering or leaving the subdivision. It was also noted the homes were established before the business was opened. In rebuttal, Snyder, as he did at the March APC meeting, noted some of the lots on the east side of the plat along SR 13 were originally platted for commercial use. He said screening would be put in place to “totally isolate” the residents from the commercial operations. The only way for Davidsen to expand his business, Snyder said, is for the residential lots Davidsen purchased to be rezoned to commercial. Mike Kissinger of the APC said he could understand a business wanting to expand, particularly in that area, but in this case the residential lots were there first and the commercial should not be expanded into a residential area. He made a motion to deny the petition, which was seconded. County commissioners have the final authority and will consider the petition at their Tuesday, April 17, meeting. In other business, approval was recommended to rezone ground from public use to commercial in Pierceton. SSK McDonald Properties wants to rezone a lot on Market Street, at the intersection with Second Street, formerly used by a telephone company. An antique and furniture restoration business utilizes the building and has done so for a few years. Pierceton Town Board will consider the petition at its Monday, April 9, meeting. The only other item of business was a brief report from Matt Sandy, assistant planning director for the county, who requested permission to advertise amending the county’s flood control ordinance. Presently homeowners with homes in a flood plain are only allowed to make substantial improvements to their homes once. The amendment would allow a cumulative effect of improvements at a cost not to exceed 50 percent of the home’s assessed value. The APC voted to allow advertising the amendment and will consider it at the May 2 meeting. It was noted the Department of Natural Resources is considering changing the 50 percent threshold rule, so it is important the amendment be considered as soon as possible.